Cover illustration: Stone City West by Robin Moline. Read more about the cover and order a poster version. 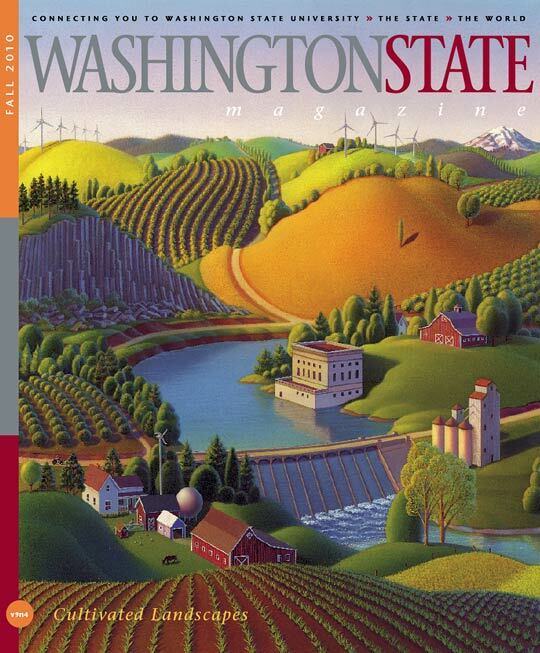 The cover illustration for Washington State Magazine’s Fall 2010 issue—Cultivated Landscapes—pays homage to Grant Wood’s famous Stone City, Iowa painting of 1930. It was Wood’s first major landscape and is now on permanent display at Omaha’s Joslyn Art Museum. Wood is most closely associated with the American movement of Regionalism and advanced figurative painting of rural American themes in an aggressive rejection of European abstraction. Stone City, Iowa was painted the same year as his seminal American Gothic. Wood by now had abandoned his earlier Impressionist-inspired style for a clear and studied vision: ordered landscape, stylized hills and trees, and characteristic swellings and ovals. Wanda Corn (Grant Wood, The Regionalist Vision. New Haven: Yale University Press, 1983) writes of the sensuousness of Wood’s land, anthropomorphic in an almost human form. While some critics have complained that Wood’s landscapes lacked emotion, others countered that these compositions are rather purposely distanced from the viewer and imbued with a kind of ironic regret. Since this issue thematically examines our own intimate connections to our Northwest land—in both its natural and cultivated forms—what better piece to serve as a point of reference? Robin Moline is a commercial illustrator whose artwork has been commissioned by clients around the globe. 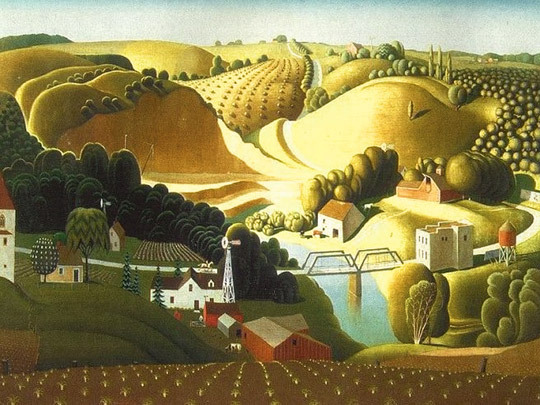 Upon graduating from the Minneapolis College of Art and Design she began exploring a style reminiscent of Grant Wood and other Regionalist Artists of the 20s and went on to make it her signature style. She has won numerous awards for her illustrations used in advertising and publishing, and has a permanent mural on display at the John Deere Pavilion in Moline, Illinois. Her studio is located in the St. Croix River valley where she resides with illustrator-husband Leland Klanderman. You can order the cover illustration as a poster at zazzle.com.